Hortus Camdenensis | Gladiolus watsonius Thunb. Half-hardy cormous perennial from the Cape with basal leaves to 70cm, and spikes bearing up to 6 bright red or orange red flowers, to 7.5cm long, yellow in the throat, in summer. To 70cm. [CECB, RHSD, Hortus]. ‘At first sight, one would be led to regard this plant as an Antholyza rather than a Gladiolus, its flowers bearing a great affinity to those of the Antholyza [Watsonia] meriana, which differs widely from those of Gladiolus communis: Prof. Thunberg having thought fit to make a Gladiolus of the plant, he could do no less than regard this as a Gladiolus also.’ [BM t.450/1799]. ‘We are induced from the beauty and rarity of this plant [Gladiolus watsonius var. beta ‘Dwarf Watson’s Corn-flag’] (though a variety differing in little else than colour from that already published by Mr. Curtis) to offer it to the public. It has been very lately imported from Holland by Mr. Colville, of the King's-Road, Chelsea, and we believe has never before before been seen in England. It is not above one-third the height of var. alpha, and is of a more beautiful colour. […] Flowers in February and March: alpha was found at the Cape by Thunberg on the sides of mountains, particularly on those of Leuestart, also near Constantia, and in some other districts, flowering in our summer months. […] We suspect [beta] to have been produced by seed in Holland, never having yet found it in any herbarium or seen it produced from any bulb immediately from the Cape. It is not improbable that the diminished stature may be in some way connected with the variegation of the corolla. […] We have observed the same diminution in size in several other instances in this natural order upon the flower becoming variegated.’ [BM t.569/1802]. ‘Although our climate is so different from that whence this beautiful plant is derived, it nevertheless grows and flowers here in great luxuriance.’ [LBC no.1949/1833]. Introduced to Britain in 1791. [JD]. Listed in all published catalogues [B.173/1843]. 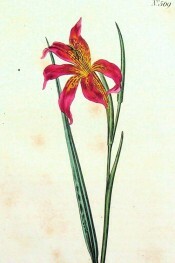 It was received as Gladiolus praecox per ‘Sovereign’, February 1831. [MP A2948-3].